Kedarnath, situated in the Garhwal Himalayas at a height of 10,500 ft. above sea level, is in the Uttar Kashi district of the northern state of Uttaranchal. 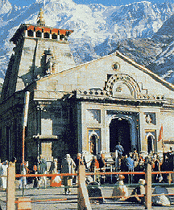 Kedarnath with one of the 12 jyothir lingas of Shiva, is amongst the premier pilgrimages in India. The uniqueness and greatness of this temple is mentioned in the Vedas, Ithihaas and the Epics. It is at the base of Mandakini river, in a valley two and half km, surrounded by high snow covered mountains. Besides its religious significance, it is also visited by those who love to conquer the rough terrain of Garhwal. According to legend, the Pandavas sought Lord Shiva's blessings for redemption from the sin of killing of Kauravas. But the Lord eluded them by taking the form of a bull in Kedarnath and when followed further by the Pandavas, he went down into the earth, leaving behind the hump there. This conical protrusion about five feet by four feet or 'jyothirlingam' is worshipped as the idol in the Kedarnath temple. Other parts emerged at four other places: arms at Tungnath, face at Rudranath, belly at Madmaheswar and the locks of hair with head at Kalpeshwar. All the five shrines are worshiped as 'Panch Kedar'. 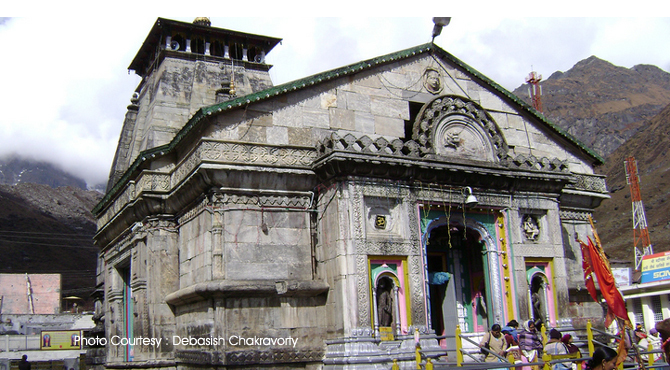 The original temple (now extinct ) with 12 Jyothirlingas, was built by the Pandavas at the present site and Adi Sankaracharaya restored the present Kedarnath temple. The Samadhi of Adi Sankaracharya lies behind this temple. The statue of Nandi, the divine bull of Shiva, stands at the entrance of the temple. Inside the temple, there are marvellous sculptures of Kedaragouri, Krishna, Pandavas, Draupadi, Karthikeyan etc. The shrine is covered by snow for 6 months in a year (closed from Oct-Nov up to Apr-May). The statue is carried to Ukhimath, and is reinstated in Kedarnath in the month of May. The Bhairavnath temple, situated to the south of the main temple of Kedarnath, is dedicated to Lord Bhairav, the deity who guards the main temple in winter when it is closed.